Retrocommissioning (RCx) is a systematic process for identifying less-than-optimal performance in your facility’s equipment, lighting and control systems and making the necessary adjustments. While retrofitting involves replacing outdated equipment, retro-commissioning focuses on improving the efficiency of what’s already in place. There are numerous utility, state and federal incentives to help off-set your improvements. The Institute for Building Efficiency fact sheet describes “Retro-Commissioning” as a process to improve the efficiency of an existing building’s equipment and systems. It can often resolve problems that occurred during design or construction, or address problems that have developed throughout the building’s life as equipment has aged, or as building usage has changed. Retro-commissioning involves a systemic evaluation of opportunities to improve energy-using systems. Focuses on improving the efficiency of what is already in place. Projects can improve your facility’s work environment and extend the service life of your equipment. Ensures your facilities — and the equipment and systems within them — are running in peak condition for optimal energy savings. Retro-commissioning benefits everyone in a building. Building owners see reduced operating costs from the energy savings and better equipment performance, leading to an increase in net operating income. Building occupants are more comfortable because the adjustments lead to more consistent temperature control and better indoor air quality. Building managers, meanwhile, face fewer occupant complaints and are better able to manage building systems. Retro-commissioning can produce significant cost savings in existing buildings. Savings vary depending on the building size, age and location, and the scope of the retro-commissioning process. Of the different measures typically completed as part of retro-commissioning projects, correction of operations and control measures have the shortest paybacks, while maintenance measures have longer paybacks. 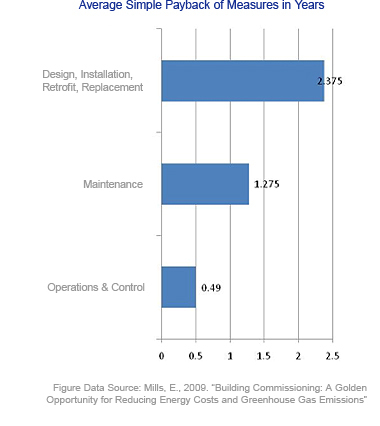 Design, installation, retrofit and replacement of equipment have the longest paybacks (see figure).